Sonar Studios is attempting to take classroom stereoscopic projection to a new level with a system that combines two high-brightness, high-resolution LCoS multimedia projectors and integrates them with a self-contained, turnkey presentation suite. 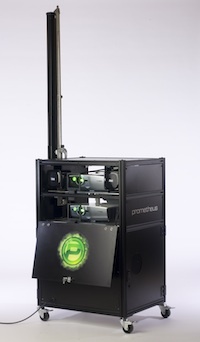 The new system, Prometheus, is an AV system that bundles a computer, a DVD player, an audio system, software, a rollaway case, and two projectors fitted with polarized lens filters. The projectors display the 3D image, which students can view with specialized glasses. The two projectors used in the system are Cannon REALiS SX800 multimedia LCoS projectors, which have an SXGA+ (1,400 x 1,050) resolution, supporting uncompressed 720p HD and WXGA video, as well as compressed 1080 HD. The projectors offer a brightness of 3,000 lumens and a contrast ratio of 900:1. An integrated 1 watt mono speaker. According Sonar Studios' Web site, Prometheus will support a variety of media including, HD widescreen video, interactive polls and quizzes, DVD content, PowerPoint presentations, Keynote presentations, interactive movies, and streaming media.